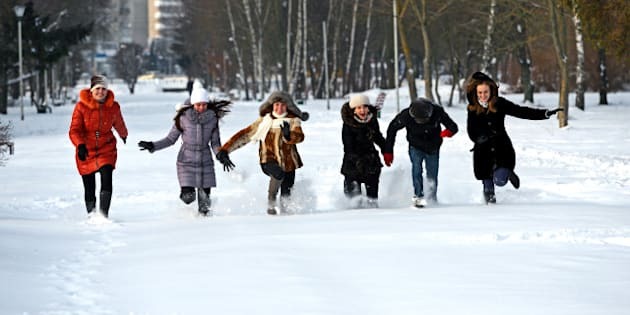 It may be the shortest month, but February can be tough to slog through with its bone-chilling temperatures, limited daylight and (shudder) Valentine’s Day pressures. There is one bright spot, though, if you’re lucky enough to live in one of the provinces that observes Family Day. The holiday creates a much-needed long weekend in the midst of one of the year’s most depressing months. And, in spite of its name, it’s not a holiday that’s ridden with never-ending family commitments, a la Thanksgiving, Easter and Christmas. Not sure how to make the most of Family Day? Here are 10 unconventional ways to spend your bonus day off – with or without your family. 1. Bounce the day away at an indoor trampoline park. Yes, that’s a real thing. Trampoline parks are gaining popularity across Canada, with facilities that offer everything from trampoline dodge ball and volleyball to trampoline aerobics. Don’t worry – the trampolines are tucked away in padded rooms, so it’s not as dangerous as it sounds. 2. Watch an entire season of a TV show you’ve been meaning to get into. Tired of being left out of heated water cooler discussions about highly addictive shows like Homeland, Sons of Anarchy and Boardwalk Empire? Well, now’s your chance to catch up. Close the blinds, order some pizza and settle in for a deliciously lazy day on the couch. 3. Visit a specialty museum or art gallery, like the BATA Shoe Museum in Toronto. You’ve probably already been to your city’s main art galleries and museums at least once or twice. Well, today could be the day you expand your horizons by venturing off the beaten path to soak up the fascinating history of, say, shoes. 5. Explore a new neighbourhood. Allow yourself some time to wander through unfamiliar territory. Who knows what you might discover: ethnic enclaves you didn’t know existed, beautiful parks hidden amidst residential neighbourhoods and maybe even some stunning architecture in an older part of town. You may be surprised by what your city has to offer beyond your regular stomping grounds. 6. Gather the gang for a rousing game of laser tag or paintball. You’ll not only get a chance to catch up with friends (and any family members who may be inclined), you’ll also burn off some of those winter calories your body has been clinging to. 7. Volunteer for a worthy cause. Be selfless with your bonus day by giving back to those around you. Not sure where to start? Chances are pretty good that your community has at least one website outlining local volunteer opportunities, such as Volunteer Hamilton or Volunteer Ottawa. 8. Take a mini road trip to see an elderly relative. Surprise your Aunt Phyllis by popping in for a visit at her retirement residence located an hour or two outside of the city. Once you’re done catching up, explore her town’s local attractions, or take a detour to check out a stunning nearby natural attraction. 9. Dive into one of the books that’s been sitting unopened on your nightstand for months. You know the pile we’re talking about. It’s full of gifts you haven’t gotten around to reading yet, and reads your friends can’t stop raving about. You’d better crack Gone Girl now, before a pal accidentally lets the ending slip. 10. Host a board game tournament. Invite some friends and family over to geek out with you playing Settlers of Catan, Cranium, Trivial Pursuit, Risk or a childhood favourite until a definitive Board Game King or Queen can be crowned.